The comfortable barstool LX659 was designed by Frans Schrofer. It is in the same formal idiom seen in the armchairs LX662 and LX682 and the chair LX663, making it the latest addition to this product family. Like the other items in this programme, the barstool can also be ordered with the skilfully sewn ‘Artisan’ seam, which replaces the standard zipper on the back of the stool. Clients can choose between any of the fabric and leather options in the LX collection for the upholstery. 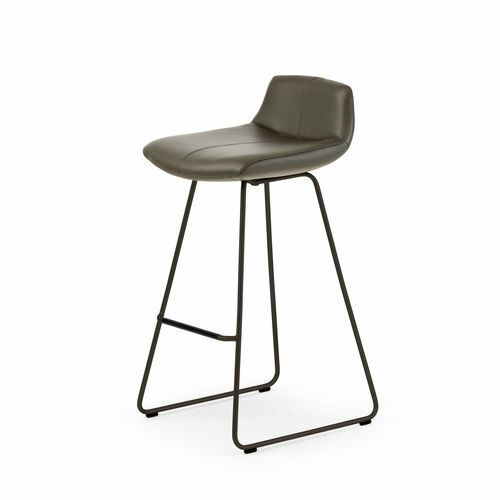 The steel frame of the barstool, which incorporates a comfortable footrest, can also be coated with any of the colour options in the collection. The LX659 barstool has a seat height of 78 cm and can be used in a wide range of settings, from bars and restaurants to informal workplaces.